Holy Cross Loft apartment in Florence offers accommodation for 4 people in a very central location of the city. It has been renovated in 2010 into beautiful vintage Florence apartment. It features a bright living room with 2 big windows and a sofa that can be turned into double bed, a loft with double bed that can be separated into two single beds and 1 bathroom with the shower. There is also a dining room with round table and an open-plan kitchen with full equipment for cooking and tasting delicious Italian pasta. For check-in from 21:00 there is an extra charge of 25 €. For check-in from 23:00 there is an extra charge of 40 €. The apartment Holy Cross Loft is located in Santa Croce area. Apartment is situated on the building's 1st floor, just next to the Piazza Santa Croce. From that convenient position, you can very easily reach Ponte Vecchio, Il Duomo or Piazza della Signoria. In Piazza Santa Croce, you can see the dominant Basilica Santa Croce with its impressive Cloisters, also known as the Temple of the Italian Glories, since it is a burial place of the most famous Italian artists, like Galileo Galilei, Michelangelo Buonarotti or Niccolo Machiavelli. 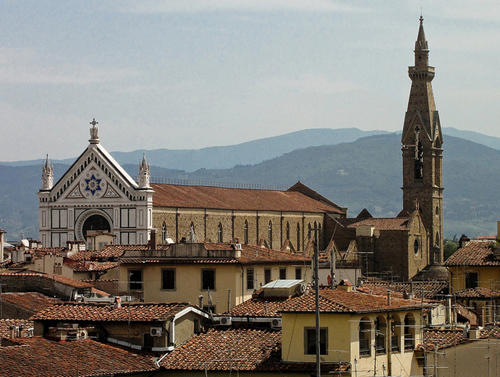 It is an amazing location for exploring Florentine arhitectural and historical treasures. Santa Croce Square - 0.08 km. Uffizi Gallery - 0.55 km. Brunelleschi Dome - 0.70 km. The Santa Croce neighborhood hosts one of the most beautiful piazzas in the Florence city centre- Piazza Santa Croce, with its imposing gothic basilica that has seen many changes in the history and identity of the city. From there the typical streets of Florence start spreading, as well as the stone buildings, trendy restaurants, artisan shops and new fashion stores. Charming Florence apartment, decorated in vintage Tuscan style. It is situated in the heart of the city, just a few steps away from Pizza Santa Croce and marvellous Ponte Vecchio.